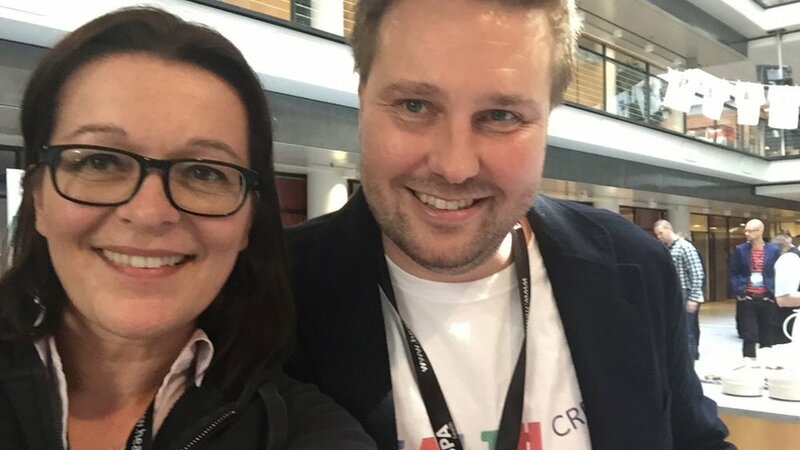 Eeva Kiuru and Mikko Kauppinen at Upgraded Life Festival in Helsinki May 2015. If you prefer reading, here you can find the transcript of the interview. Eeva Kiuru: Mikko Kauppinen, ecosystem leader in Health Innovation Village, a GE ecosystem in HELSINKI. How has the event been for you Mikko? Mikko Kauppinen: Oh it’s been great. I think it’s much better than last year I have to say. I mean, this is the right place for it. When we talk about health technology being here in the hospital campus area and having the connection to, really, the largest hospital group in Finland. That’s the optimal place to be, to connect all the players and having more emphasis on really health technology. It’s been, I think, fantastic and I think there’s been great presentations, there’s tons of start ups here, a lot of noise as you can hear, so loving it. Eeva: Great. What categories are you especially interested in looking as a ecosystem player representing a big company? Mikko: Yes, GE Healthcare, overall, in Finland is focused on patient monitoring systems. So we want to expand that with our ecosystem. So, therefore, our ecosystem centers around digital health, that’s really the key for us. It’s about sensor technologies, it’s about low-battery consuming electronics, it’s about algorithms, it’s about big data, it’s about industrial internet, of course, machine to machine connections, data analytics. That type of themes and technologies are the ones we’re interested in. Eeva: Right, and obviously those are the ones that are impacting most the healthcare, what we are seeing today. Mikko: Well, I think there I think there’s many different aspects of healthcare that are making an impact, but I would say that this is an area of healthcare that is the prime spot and maybe the first area of disruption. So if you look at health technology, it’s been very much sort of like the bigger players and then smaller players but always like smaller players being consumed into the bigger players. So we haven’t seen really, in health technology, much of disruption that you’ve seen in Ubers of the world or AirBnBs. We haven’t seen that really, but we think that in our area, this could be a reality. And instead of just waiting and protecting our market share and our position, we’re just trying to create the disruption around ourselves and inside our business. So that’s why we’re heavily interested in being an ecosystem player and really playing with the start-ups and seeing what we can invent together. Eeva: Very cool. You are meeting a lot of entrepreneurs sharing their ideas and new innovations. What do you think is the biggest challenge they have when they are entering this challenging healthcare market? Mikko: I think one is access to the real healthcare service providers. So, in order for them to have an idea and test the waters with the idea, so getting even feedback, I’m not even about piloting the product, I’m not talking about clinical trials, I’m talking getting the access and getting the feedback from clinicians, researchers, and all that. So that’s the first hurdle. The second one comes into when they want to really pilot. Maybe get a little bit money from the pilot. So that’s the second hurdle that, clearly, we have. And the third one, third big component, of course, in Finland is funding. Funding an ecosystem in Finland has been dominated by public funding. So tech is driven very sort of like different grants type of things, and we don’t have a very wide venture capital ecosystem here. So those are the three things that if I want to have to see that we have made great improvements in the next three years is that we fixed better access to all these clinicians and researchers that we have around us. Secondly, places to pilot the products and validate the assumptions on it. And thirdly, to have early seed or venture investors into the start-ups that we have. Eeva: Sounds great. Finally Mikko, if somebody now gets the inspiration to start their own health company, what is your number one advice? Mikko: Okay, so I mentioned the number one challenge that they have. That would be my number one advice to do. So unfortunately, it’s difficult but what I would do is rather than trying to fix on your own, in a lab, a solution that customers might buy and spending a lot of time and a lot of effort and maybe even money doing that. Rather than doing that, go much earlier, even before, and just ask the customers, “What problems do you have and what do you want me to solve for you?” And so I know it’s hard to do and it seems, but we need to do that much more in Finland. We need to be earlier at the customer and ask what do they want. Eeva: Excellent advice, thank you very much Mikko. Have a nice day. Did you miss our first episode with Health Tech Investor Timo Ahopelto? Never mind, you can find it here.